View More In Tape Reels. Designed specifically for construction, survey, road maintenance and other outdoor work. 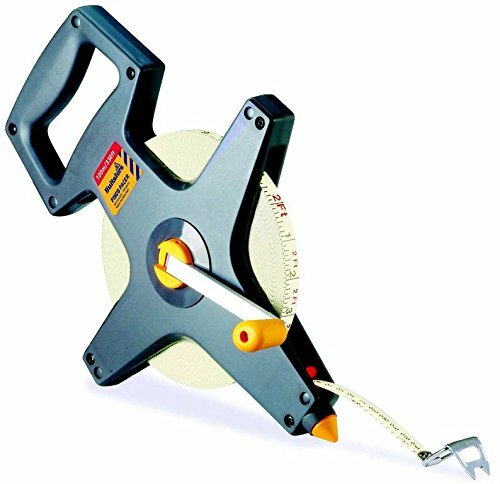 The steel blade features a tough white polyester coating with an additional transparent top coating to protect the printed measurements. Tough ABS construction with an open frame design for easy cleaning and maintenance. Spade-style contoured handle for better grip. Tough ground spike to make measuring more accurate. Low friction-bearing rewind mechanism to reduce overheating on quick rewind. Long winding lever and easy grip knob for smoother, more controlled rewind action. Blade is marked and numbered in feet and inches (1/8ths) on top side; meters and centimeters (numbered every 10) on bottom side. If you have any questions about this product by Fisco, contact us by completing and submitting the form below. If you are looking for a specif part number, please include it with your message.